“Don’t you think daisies are the friendliest flower?” That is a line from one of my favorite movies. Do you know what movie it’s from? 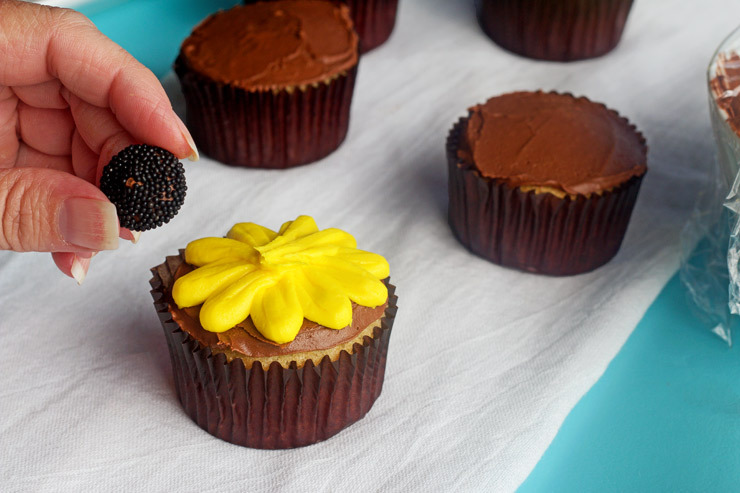 So I was thinking, if daisies are the friendliest flower, then daisy cupcakes must be the friendliest cupcakes. 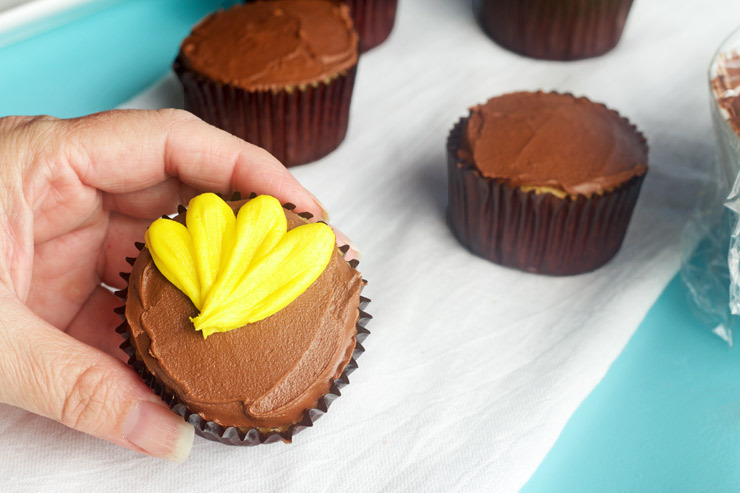 Begin by making a batch of your favorite cupcakes and buttercream frosting. Tint some of the frosting yellow and some brown. Using the #1A decorating tip, pipe some dots on a piece of wax or parchment paper. 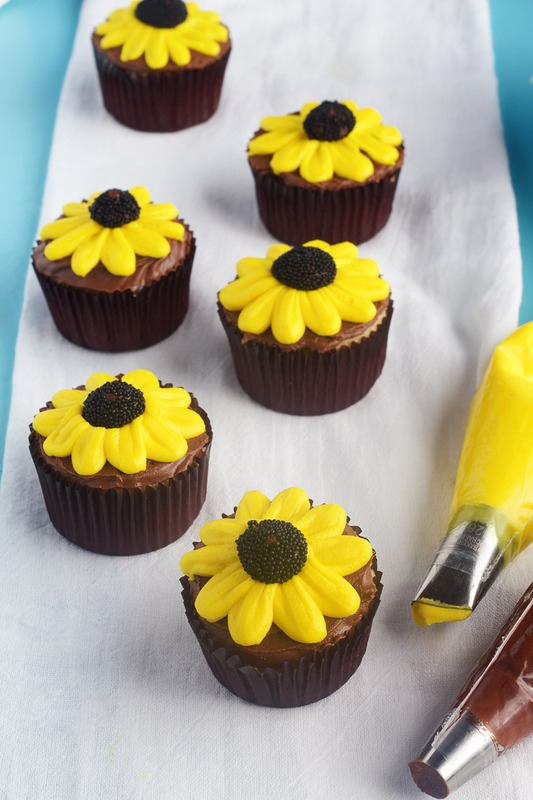 They will be added to the center of each daisy cupcake so you will need one per cupcake. 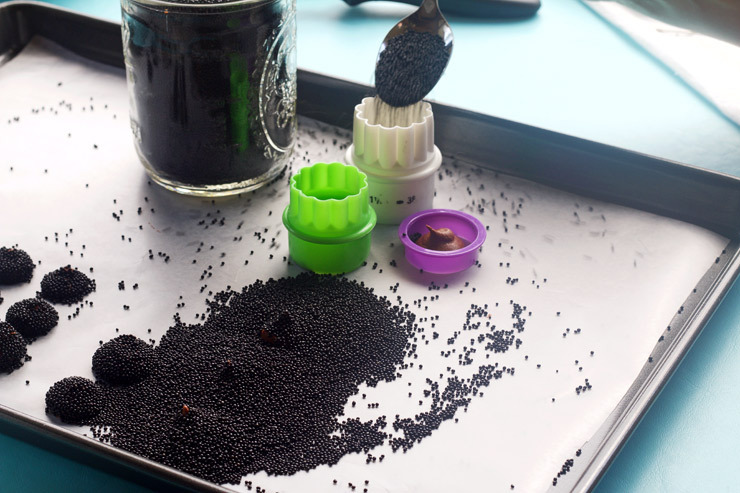 As you pipe the dots (I only did one or three at a time) cover them with the black nonpareils. 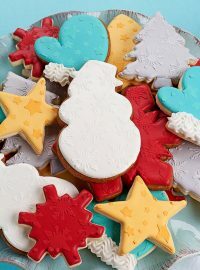 For some reason, my frosting didn’t want to be covered with them so I placed a small cookie cutter over each one and then covered them with the nonpareils. I don’t know why but this seemed to work. Place the dots in the freezer. 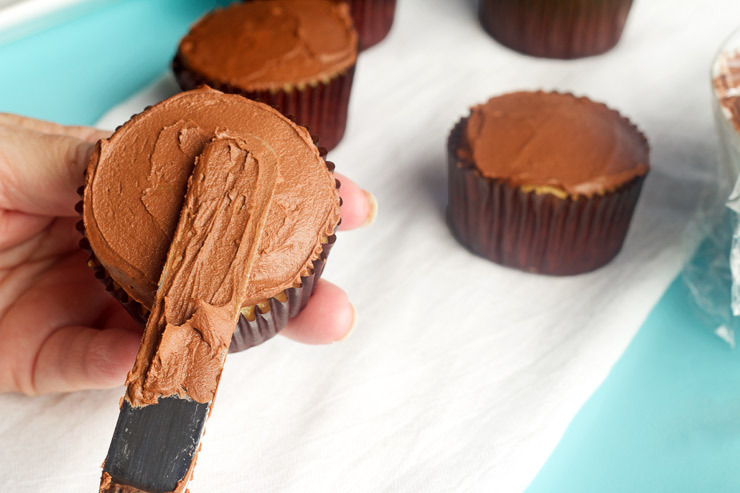 Cover each of the cupcakes with the brown buttercream frosting. I used a rose tip so I wouldn’t over frost them, but you can use an offset spatula if you prefer. Next, smooth the frosting with an offset spatula. Try to get the surface as flat as possible. 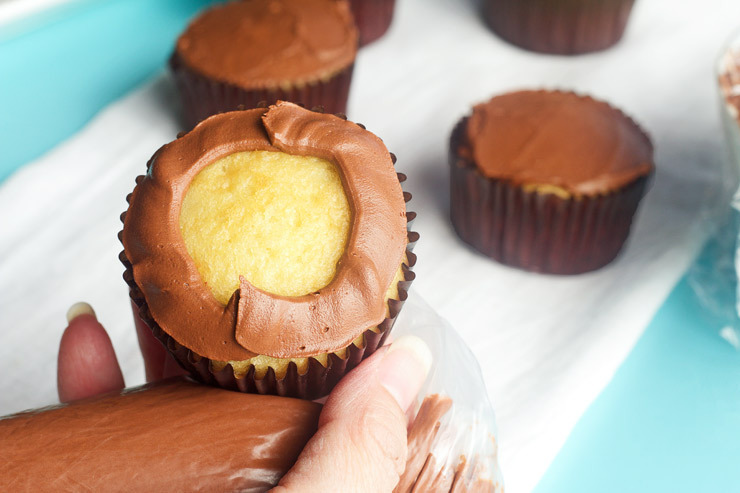 Once the cupcakes are frosted, place the wide end of the #126 decorating tip at the edge of the cupcake with the small end pointed at the center. 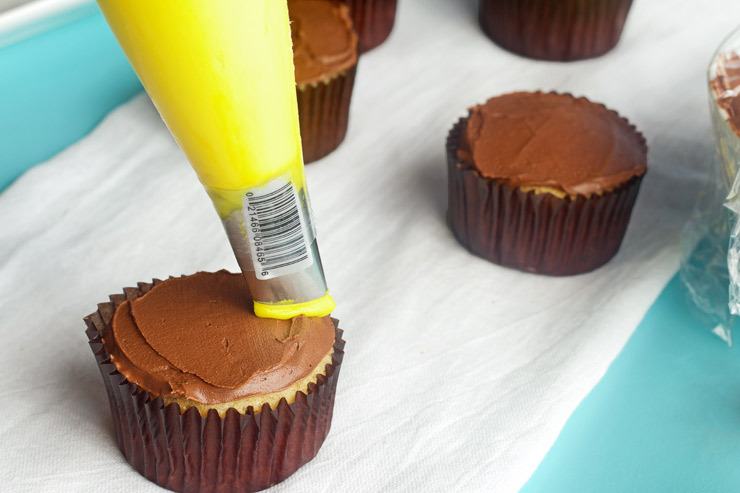 Apply pressure while you squeeze the tip toward the center of the cupcake. Release pressure and continue to pull the tip through the flower petal you just piped. End with a quick jerk. 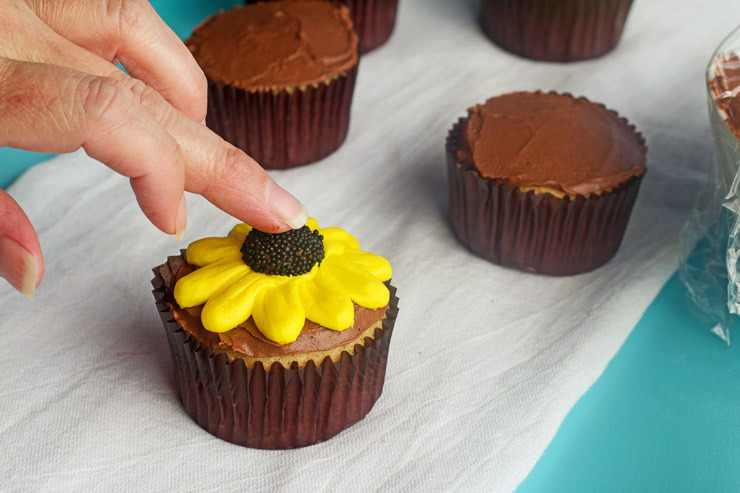 Continue to pipe all the petals of the daisy cupcake. Remove a flower center from the freezer and place it in the center of the daisy. The centers will thaw out quickly so only remove a few at a time. 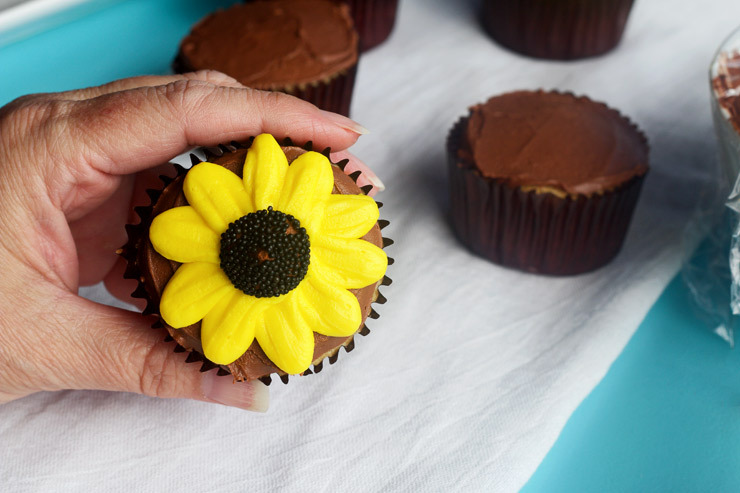 Now you have a cute daisy cupcake. I told you they were simple. 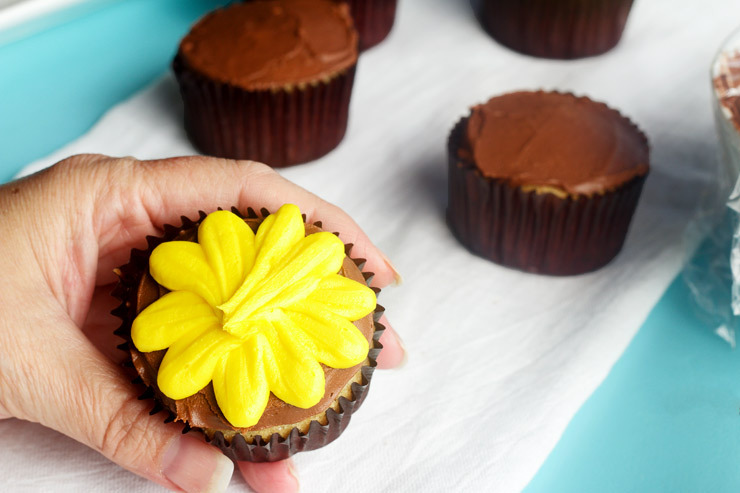 When I made the daisy flower on the cupcake in the video, I didn’t use enough frosting. The daisy looks a little puny. Learn from my mistake and make your daisy petals nice and full. 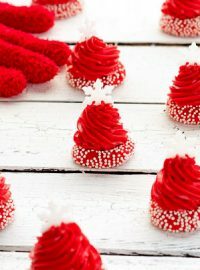 Cute cupcakes don’t have to be hard to make. 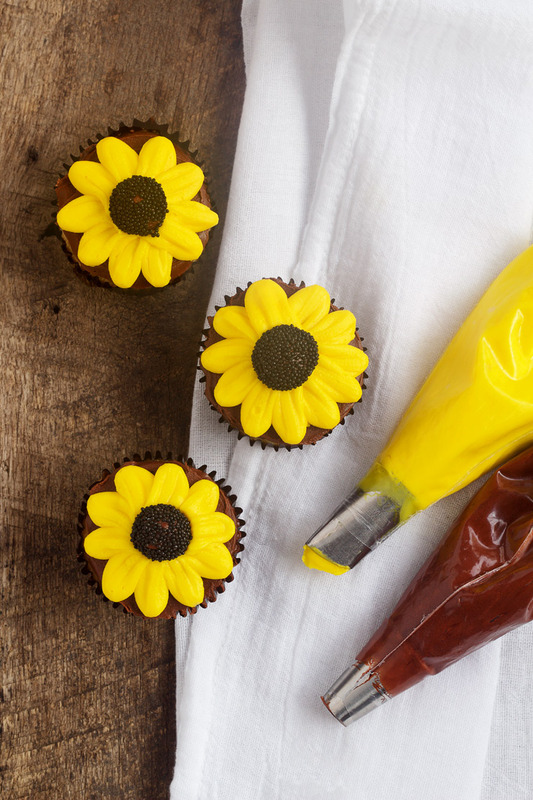 Simple little daisy cupcakes have the power to brighten your friends and families day. Don’t believe me? 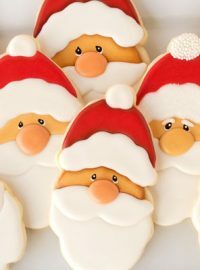 Just make some and watch the smiles pop up all around you! My favorite movie too–You’ve Got Mail!!! 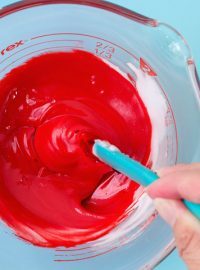 This is going to seem like a VERY basic question (because it is), but have you ever made a tutorial on how to mix and bake the perfect cupcake? Sometimes my cupcakes look great with a cute little mound in the middle, but other times they are flat or even dipped in on the top~ GASP! Maybe you have already made this tutorial or maybe everyone else in the world knows how to make and bake a proper cupcake- except me. Hi Pam! 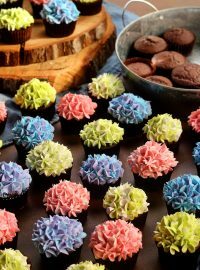 I want a flower bouquet of your cupcakes! Sounds like they will be amazing!! 1: Check the oven temperature with an inexpensive thermometer from Wal-Mart. Sometimes the actual temp of your oven could be off and that could cause the sinking. 2. Don’t over mix the batter. Over mixing the batter will also make them fall flat in the middle. 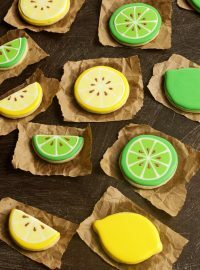 3.Be sure to check the dates on your ingredients. 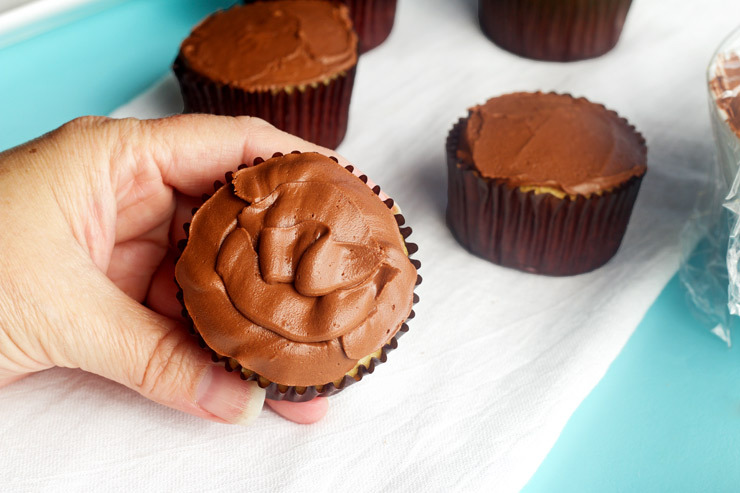 Old baking powder or cocoa can also make your cupcakes look a little on the sad side! Daisies are my second favorite flower next to sunflowers, but these cupcakes sure do make me happy!